What a fantastic weekend for February - sunny skies with good cumulus, lots of lift and warm enough to dispense with all the winter layers of clothing. The skies were inviting enough to get many private owners to rig and fly as well as emptying the hanger of all the club gliders so that they could fly. Just to add a bit of fun to the day, there was a runway change from 35 to 24. The Duo Discus is back from Poland where it has been refinished and now looks like a brand new glider. Early feedback from those who have flown it is good saying how well it flys and how much quieter it is. Its a fantastic asset for the club - please make sure you take the effort to keep it in absolute tip top condition. Duo Discus looking resplendent after its refinish with the two pilots who seemed to have adopted it! The club also took the opportunity to try out a new tug and consider how it may fit into our normal operational needs. The airplane is a EuroFox which has its roots in the home build/microlight world but has been in use as a tug for several years across Europe. We had the chance to tow several single seaters and the K13. Sunday 19th February really felt like the season had started. The air mass following the previous days cold front passage promising cumulus as high as 6,000 feet (but extremely cold) brought out the keener members who are getting their practice in early. With a trio of private owners rigging and towing out to runway 35 in the brisk northerly, we had our first grid of 2012 with launching from around 10:00 until the last launch around 17:00 when there was still some evidence of lift about. Several flights of over 1 hour were flown by a mix of K13, K21 and Juniors under the cloud base that went to over 5,500 feet over the Oxford plain. The high cloud base was accompanied by extremely good visibility with Milton Keynes and Bedford being clearly visible throughout the day from Booker. Sally Longstaff and Mark Wolff completed their BI training and will be a regular addition to the team of instructors - congratulations to them both. 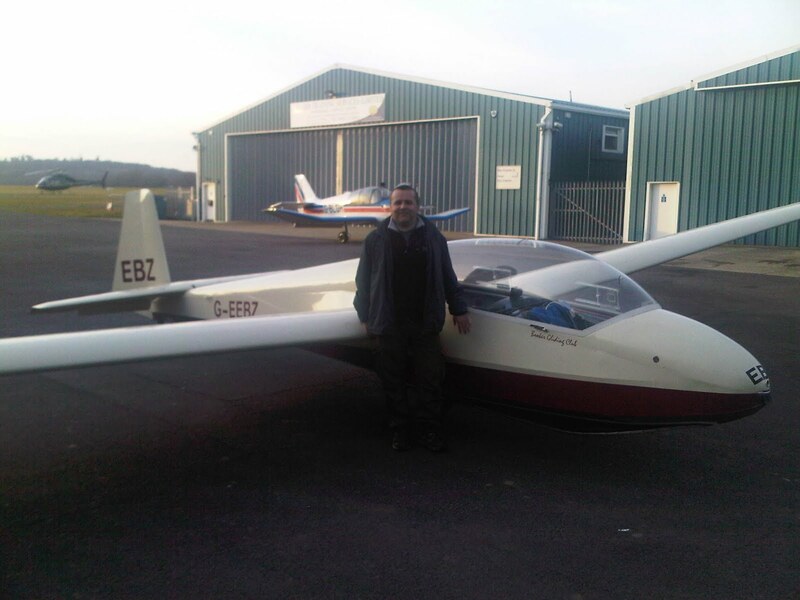 Steve Williams flew his LS8 in both 15 and 18 metre modes and went to Bicester and back, Will Ellis set off and flew 200k doing Daventry, Winslow & Towcester before landing out just short of a final glide at the Golden Ball. The retrieve was quickly sorted and supported by a police officer who stopped by to check all was OK - she was invited back to the club but either common sense or duty prevented her from accepting the offer from the retrieve crew! (see pictures below). John Herman being put into cuffs! The ground was frozen hard, and the warming sun left the ghost of a glider in the grass when the day's flying started. The first Saturday of the month as usual saw a bunch of hardy aerobatics pilots practising chandelles and loops and much more with expert tuition from Graham and Alun. Meanwhile back in the clubhouse the final Bronze briefing of the winter was underway, after which Simon Vardigans took the test and passed with flying colours, congratulations Simon. He now only needs one more launch to gain his Bronze badge, unfortunately the advance of the snowy front put paid this. 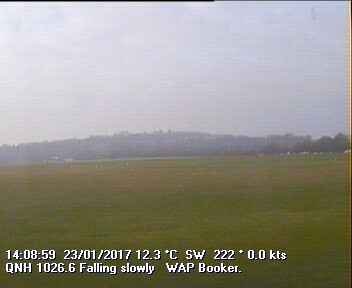 Next week the FOG (Fundamentals of Gliding) briefings resume, details on the Members page of the club website http://www.bookergliding.co.uk/members/BGC3459.html or the poster on the clubhouse noticeboard. Lots of helpful tips and advice for pilots at all levels.